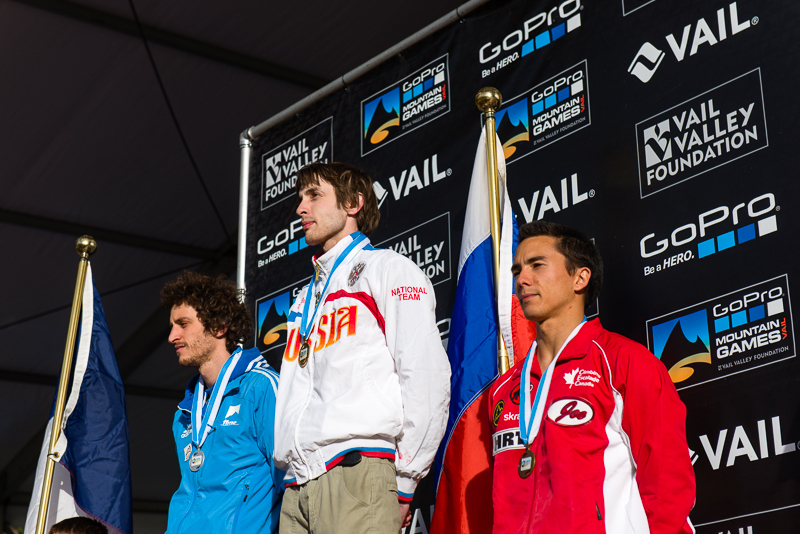 The 6th stop on the 2014 IFSC Bouldering World Cup circuit took place this past weekend in Vail at the 2014 GoPro Mountain Games, and it was Japan’s Akiyo Noguchi winning gold for the women while Russia’s Dmitrii Sharafutdinov took home gold for the men. For the women, Akiyo Noguchi put on a superior performance all weekend completing each problem in each round including finals where the nearest competitor, France’s Fanny Gibert, only completed two boulders. Noguchi climbed with intensity and purpose throughout the finals, pounding the wall as she matched the finish hold of each problem. 16-year-old American Meagan Mascarenas acquitted herself nicely in her first World Cup final with a solid round that included the first top of the final problem1, enough to land her in 4th position. Current overall World Cup leader Shauna Coxsey was not in top form the entire weekend, but that did not stop her from still making finals and placing 5th to maintain her place at the top of the overall standings. For the men, Russia’s Dmitrii Sharafutdinov returned to the circuit a week after not being able to compete in the Toronto event due to Visa issues. During a very tightly packed semi-final round Sharafutdinov was in danger of not even making the final until he was one of only two men to complete the tricky slab that was Men’s #42. 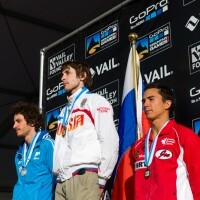 Once in the final though he did not look back as he topped all four finals problems to best France’s Guillaume Glairon Mondet and Sean McColl who both sent three of the finals problems. The World Cup circuit continues in just under two weeks with a stop in Haiyang, China.